Family! Friends! Fun! Come out to the Owensboro Sportscenter on April 18th to cheer on Owensboro’s very own Owensboro Thoroughbreds Professional Basketball Team. Game starts at 7:00 PM. Family! Friends! Fun! Come out to the Owensboro Sportscenter on April 18th to cheer on Owensboro’s very own Owensboro Thoroughbreds Professional Basketball Team as they take on the Jamestown Jackals. Game starts at 7:00 PM. Tickets on sale online at OwensboroTickets.com, or check out Owensboro Thoroughbreds website at OwensboroBasketball.com. Tickets available at the door one hour prior to game time. Join fans in support of Owensboro’s very own professional basketball team!! The Rosine Barn Jamboree is located at 8205 Blue Moon of Kentucky Hwy (US 62) in Rosine, KY.
On the National Register of Historic Places, the Rosine Barn offers live bluegrass music & dancing every Friday night. Opens on Friday evening April 5th, then each Friday night to the second weekend in December. Doors open at 5:30pm. There is open mic from 6-7pm, then the Show starts at 7pm! Information please contact 270-363-9425. Bring your lawn chair for when seating gets scarce! Selected “one of the 52 Places to Visit in 2016” by the New York Times. Family! Friends! Fun! Come out to the Owensboro Sportscenter on April 19th at 7:00 PM to cheer on Owensboro’s very own Owensboro Thoroughbreds Professional Basketball Team. Game starts at 7:00 PM. Family! Friends! Fun! Come out to the Owensboro Sportscenter, April 19th to cheer on Owensboro’s very own Thoroughbreds Professional Basketball Team. Game starts at 7:00 PM. The 2019 Market Season will open Saturday, April 20 thru November 2 at the corner of Triplett Street and Parish Avenue, 1205 Triplett St.
​April 20 thru November 2, Saturdays 8:00 am – 12:00 pm. June 4 thru October 31, Tuesday and Thursday 6:30 am – 12 :00 pm. 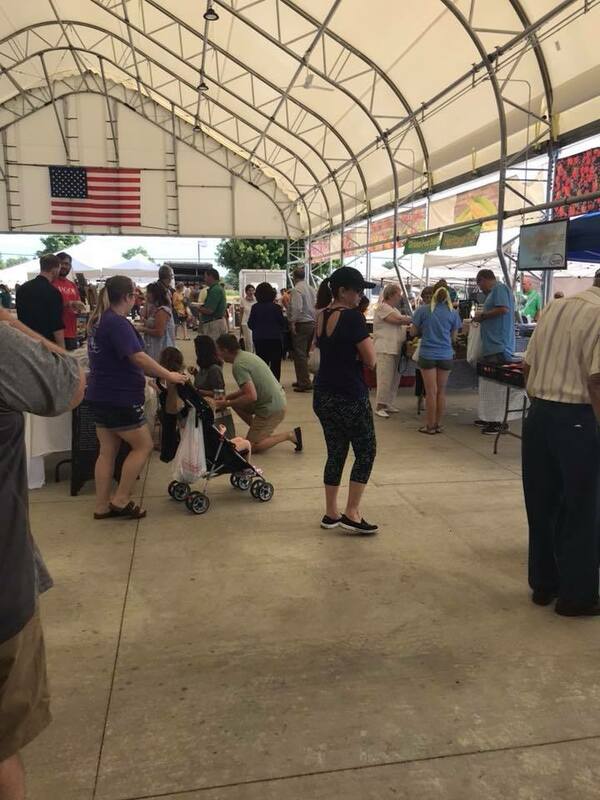 May 15 thru August 28, a satellite market is also located at the Owensboro Health Regional Hospital, 1201 Pleasant Valley Road, on Wednesday from 1:30pm – 5:00pm. Both locations have parking lots for your convenience. All vendors accept cash, most will accept personal checks, and some will accept credit/debit cards. The Market also accepts SNAP/EBT payments as well as credit cards. More detailed information is available on their website. Check it out! Join us for our EGG-ceptional Egg Hunt & Bunny Fun on the Farm on Saturday, April 13th & Saturday, April 20th from 11am-4pm! It will be one of the most EGG-citing events at the farm this year! Join the Easter Bunny, as he gets things hopping around the Farm. This event will feature non-stop egg hunts with prize packs for the kids, meet and greet with the Easter Bunny and his many friends, great photo opportunities, storytime with the Easter Bunny, meet and feed the baby animals in the Animal Barnyard, Jumping Pillow, Face Painting, and 20+ Family Fun Acre Activities! Don’t forget to bring your Easter basket! Our Egg Hunt runs from 11am – 4pm and you are welcome to come at ANY time during that period. Each child gets to collect 12 eggs of different colors from the hunt, after the exciting adventure of hunting eggs, each child will bring their eggs back to our EGG-ceptional Egg Toss Game and have fun returning them to receive a prize pack from the Easter Bunny! The cost for the Egg-ceptional Easter Egg Hunt & Bunny Fun on the Farm is $12 per child, Adults & 12 months Under are FREE for this Event. Tractor Supply Company is excited to announce Saving Paws Animal Rescue of Kentucky’s 7th annual Easter Bone Hunt!!! This is by far our most popular event with well over 100 furry babies in attendance. Easter Bone Hunt will again be set up in the field to the right as you enter Ben Hawes Park. Registration starts at 11:00am with the first hunt at 11:30am. It’s always busier at the beginning, so if your pet is sensitive to excitement or just starting to get socialized, coming later in the event at 1pm or after will ensure a quieter hunt. $10 per dog to hunt. $20 per pet for pictures. OR you can do both for only $25! All proceeds go to Saving Paws Animal Rescue of Kentucky! Easter Extravaganza will be a fun day with DJ playing music, bouncy houses for the kiddos, Easter basket giveaways, a bike giveaway, and food for the children! Children 12 and under years of age will enjoy an Easter Egg Hunt! This event is open to everyone!! Come to enjoy a family fun day!! RiverPark Center, Saturday, April 20, 2019 at 7 p.m.
A season full of fun and adventure comes to a close as the Owensboro Symphony Orchestra, Conductor, Troy Quinn, a massive symphony, and the international superstar violinist Fabiola Kim, come together to perform music inspired by fiery imagination. The Symphony takes flight as it opens the concert with Gonna Fly Now from Rocky followed by Kim’s performance of Vaughan Williams’ serene, The Lark Ascending. Vangelis’ cult classic Chariots of Fire and Stravinsky’s epic ballet The Firebird Suite close the 53rd season – A finale not to be missed! Tickets now on sale online www.owensborotickets.com or call the RiverPark Center Box Office (270) 687-2787 or purchase season tickets by calling the Owensboro Symphony (270) 684-0661. Come and worship with Christ Community Church on April 21st, at 10:00 am in the East Ballroom at the Owensboro Convention Center. Children’s programs will be provided. (There will be no Saturday service on April 20th). Mt. Calvary Baptist Church Easter Worship Service on Sunday, April 21 at 10am. Open to the public to attend. Small business, non-profit or a large company, CHAMBER WORKS EXPO is for you. Take this opportunity on April 25th from 4:00 PM to 7:00 PM to share your products, services or message with our 1,000 members, their employees, and the general public! Let’s show Greater Owensboro our CHAMBER WORKS! Presenting Sponsor, the Owensboro Convention Center, will host a reception in the lobby showcasing their best in hors d’oeuvres, complete with a cash bar. Booth packages are available, complete set up with skirted and covered table, and pipe and drape. Participation will also include coverage on our advertising and weekly emails. All participants are asked to provide a door prize to be announced by our emcee and are encouraged to make their booth engaging and interactive! Contact the Chamber at 270-926-1860 for participation information! Tickets are now on sale online or by calling Theatre Workshop of Owensboro at (270) 683-5333. Tickets in advance are $18.00 for adults, $12.00 for students. There will be a $2.00 surcharge for all tickets purchased at the door. This year’s sale will be held at the Mundy Activity Center @ 1650 W 2nd St, Owensboro, KY 42301. It’s time to get your beautiful garden growing! Selections of gorgeous plants, herbs & heirloom tomatoes! Theatre Workshop of Owensboro will present DRAMA CLUB workshops for grades 3-8. These workshops will take place beginning February 9, 2019 and every other Saturday there after, 10 am to 12 noon, at the Trinity Centre, 407 W 5th Street. The cost is $75 for the term. To register, please call TWO (270) 683-5333. “Mr. Thad” will conduct sessions on acting, costumes, make-up, lights and sound. There will be a performance on the last day for families! Get registered soon! You may sign up to attend any or all of the programs that the Joe Ford Nature Center will be offering during the 2019. The 9:00 am-11:30 am will be our younger campers 7-10 years of age and 1:00pm-3:30pm the 11-13 years of age. Specific dates are listed on the webpage. If you are a Junior Naturalist each program that you attend, you will receive one credit toward your Junior Naturalist status. After you receive twelve credits, you are officially considered a Junior Naturalist. All Nature Camp programs are offered to the community at no charge. It is requested a $6.00 donation be given per child per class session to be able to continue Joe’s wish of offering nature-related programs to our community. We recommend registration for each Nature Camp program to allow for needed materials. You may register by filling out the form online or contacting Deborah at (270) 344-0596 or [email protected]. Some crafts or projects could include items such as peanut butter, so if you have any allergy concerns, please specify when registering. “Run for the Roses”, the signature theme for Hospice of Western Kentucky Spring Fling, returns for the annual education and fundraising event with both live and silent auctions, plated meal, live music and dancing with Pink Cadillac! Tickets are on sale now online! This show is not for the faint of heart! Hard rockers Puddle of Mudd headline an electric show at the Owensboro Sportscenter on April 27 at 7pm! The band has sold over seven million albums to date and has had a string of number 1 mainstream rock hits, including “Control” and “She Hates Me” off of their triple-platinum album “Come Clean.” With support from Saliva, Trapt, Saving Abel, and Tantric, Owensboro can get ready for one rocking night! Fans, come early for the the X-Fest live Battle of the Bands pre-party outside the Owensboro Sportscenter starting at 4pm! First band will perform at 4:30pm with the second band scheduled to take the stage at 5pm. -All VIP General Admission Floor and General Admission Floor tickets are standing room only. Tickets now on sale online at OwensboroTickets.com. The Miracle Worker is a true story of Helen Keller, this inspiring drama is an American classic. Blind, deaf and mute, young Helen is in danger of being institutionalized in 1880s in Alabama. Her desperate parents seek help in the form of Miss Annie Sullivan, a “half blind yankee schoolgirl” who serves as Helen’s tutor. The journey of both student and teacher is remarkable, as they introduce Helen to the world around her. Tickets are now on sale online www.theatreworkshop.org or by calling TWO Box Office (270) 683-5333. Summer Shorts 2019 will be performed July 19-28. Auditions for the plays are Sunday, April 28th at 6 PM and Monday, April 29th, also at 6 PM. Auditions will be at Trinity Centre, 407 W 5th Street, Owensboro. No preparation is required. For more information on Summer Shorts, call TWO (270) 683-5333. The Highway 54 Yard Sale spans 50 miles from Owensboro to Leitchfield, KY and includes Daviess, Ohio and Grayson Counties. This is a bi-annual event held in May and September with great bargains for all. The Spring dates coincide with the Kentucky Derby weekend May 2nd, 3rd, 4th. The Fall dates, September 19th, 20th and 21st, allow you to combine some fantastic shopping with a visit to Fordsville Days. Many businesses take the opportunity to use these three day events to run special sales or have entertainment for the crowd. Join in the fun and make it a family day trip and treasure hunt for everyone!! The Chamber’s premier event, the Rooster Booster Breakfast, is the first Thursday of every month at 7:30 a.m. at the Owensboro Convention Center. Spend the first hour of your day enjoying a delicious breakfast while networking and listening to important issues pertinent to national, state and local business and government leaders. Reservations for the breakfast can be made by calling the Chamber by noon day before (270) 926-1860.